Boat Books Aust. P/L Website Shipping Policy Statement. This document was last updated on July 1, 2011. 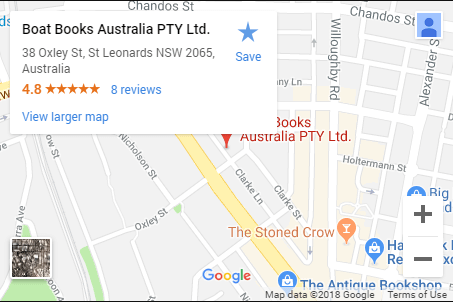 Boat Books Aust. P/L ships there products World Wide using Australia Post. Australia post $9.00 shipping and handling. Plus $2.50 per item to a maximum charge of $15.00. Plus $2.50 per item to a maximum charge of $20.00. We accept orders from all international locations. International mail $20.00 shipping and handling. Boat Books Aust. P/L has the discretion to occasionally update this Shipping Policy Statement. When we do, we will also revise the “updated” date at the top of this Shipping Policy page. Boat Books Aust. P/L will use commercially reasonable efforts to promptly respond and resolve any problem or question.